If you watch TV, you’ve seen ads for the Bowflex TreadClimber. Curious? The mid-level Bowflex TreadClimber TC10 was introduced in November 2011 and the price has remained constant at $2,199. What makes it unique is it’s low-impact, high results design. By combining the movements and benefits of a treadmill, stair climber and an elliptical, all at a walking speed of no more than four miles per hour, you’ll burn more calories and feel less tired. If your focus is on your abs, legs and cardio, this is the machine for you. You can track your progress as you work out on the four display screens – time, speed, distance and calories burned. Set weekly goals and it tracks your progress automatically. Measuring just 30.3 x 52.3 x 50.6 inches (W x H x D), its compact design means you’re sure to find a space for it. If you need to move it, it has transport wheels for mobility. Besides working your abs, legs and cardio, the TreadClimber increases your energy level, bone density, HDLs and metabolism. And it reduces the risk of osteoporosis, heart disease, back pain and body fat. It’s gentle on the joints. It doesn’t work you hard, it works you smart. You chose how fast you walk, with a speed range of 0.5 to 4 miles per hour. There’s a 2-year warranty that covers the entire machine. “Easy assembly” is a relative term, but there is an optional assembly service available. And it has cup holders! Many users report finally reaching their weight-loss goals, along with better cholesterol and triglyceride levels. One user, who describes himself as having a “plastic knee and a metal hip” purchased the TreadClimber for rehab and says it has improved his quality of life greatly. It may be compact, but it doesn’t fold up, so it takes up space you can’t get back. It’s not a treadmill. You can’t run on it. Top speed is 4 miles per hour. Unless you know someone who already has one, you can’t “try before you buy” – a disadvantage of online shopping. While there is a 30 day return policy, consider that you’ll be packing up and shipping a 185 pound piece of equipment. One user commented that “any machine is good if you use it,” but to him, it wasn’t worth the expenditure. A couple of people commented that they had a problem with the electronics of the machine and it took longer than it should have to get the replacement parts. One reviewer posited that if you walked on a treadmill set on an incline, you’d get the same result. With all the different types of fitness equipment around, you need to first decide what you want to accomplish in your regimen. If you’re thinking bulging biceps and pecs, the TreadClimber isn’t for you. It’s not a regular treadmill, so if you’re disappointed that you can’t run on it, you’re looking at the wrong equipment. But, if you want a low-impact workout that improves your cardiovascular health, tones your legs and abs, and helps drop those extra pounds, you’re on the right track. Infomercials are infamous for creating impulse purchases, but if you’re reading this, you’re doing your homework. 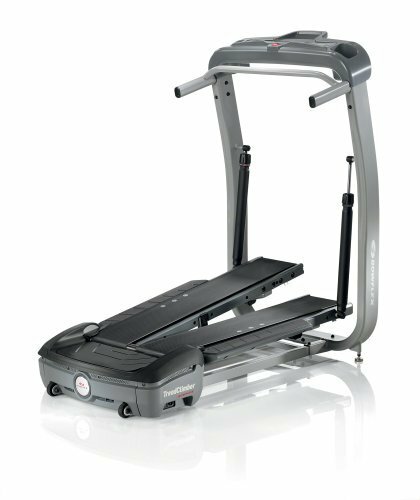 If you like the idea but you’re used to top shelf everything, consider the Bowflex TC20. It costs $3,299 and does pretty much the same thing but with more bells and whistles. For most people, an extra $1,000 is a lot for bells and whistles, but it’s your call.